A few notes about kim chee: according to “The Korean Kitchen,” kim chee has seven components including a hot or sweet chili taste, saltiness, sweetness, sourness, bitterness, astringency, and any ingredient that will intensify or enhance flavor. 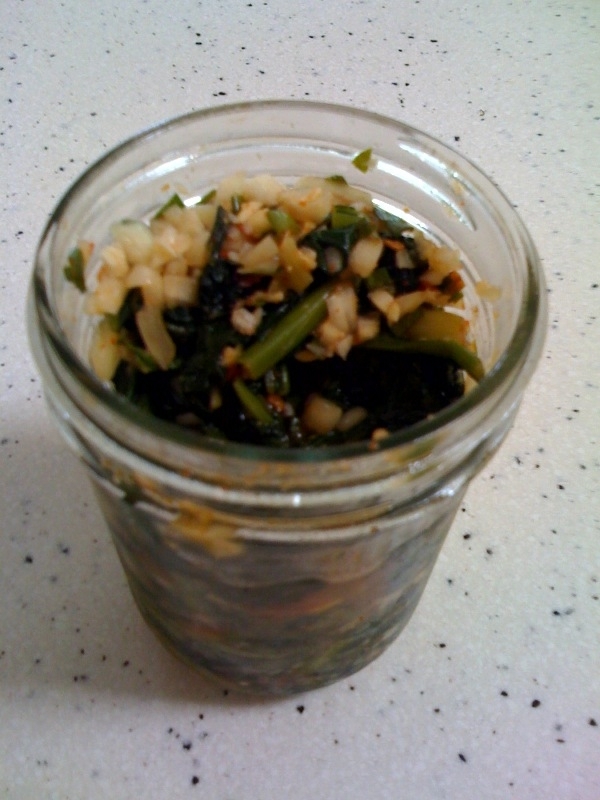 The great thing about kim chee is that the salt in it softens all kinds of greens, even ones that have gotten a little tough from late harvesting. In my recipe, I use kale, bok choy, radicchio (Italian chicory), and chard, plus I add garlic chives and green onions, which I also grow. My husband, who lived in Korea while he was in the Air Force, likes the bitter greens because he says it tastes more authentic than the pure cabbage kim chee that we buy in the store. The other nice thing about kim chee is that you can make many different kinds from greens to cucumber, eggplant, radish, and anything else you’d like to experiment with. I store mine in Ball jars and they keep in the fridge for weeks (it would last several months, but we eat it too quickly). Each night for dinner, we place it on the table like a condiment and it goes surprisingly well with a variety of meals. It’s also terrific for breakfast with rice and a fried egg. Remove the outer leaves from the greens and rough chop into 1-inch pieces (I leave some pieces larger for variety). Put greens into a colander, add salt, and mix well. Place over a bowl and let drain, covered, about two hours. In another bowl, combine vinegar, sugar, kim chee base, ginger, garlic, green onions, garlic chives, and Maui onion and stir. After the greens have been sitting with the salt for two hours, squeeze them out until you’ve gotten most of the liquid out of them. Rinse the greens for a few minutes, until you’ve gotten a lot of the salt off, and squeeze again until the greens are almost dry. Add the greens to the vinegar mixture and stir to combine. If needed, add a pinch of Hawaiian salt and stir again. Put the mixture into sterile glass jars and pack the greens down. Add enough water to cover. Close the jar and refrigerate for at least four hours. A little goes a long way so if you make enough jars, you can give some away to family and friends. Ma-ni dŭ-se-yo!